Download our poster, bookmark, or graphics to use online or in print as you plan your month! (Click images to download.) 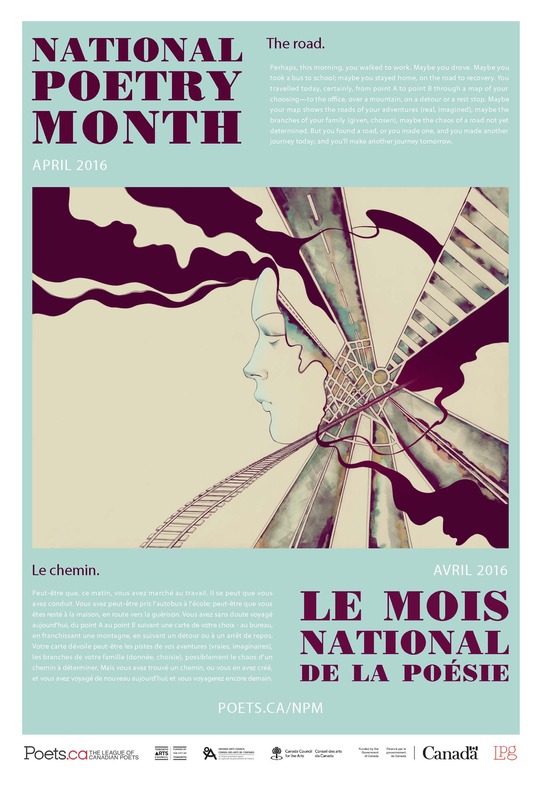 Contact admin@poets.ca if you are interested in receiving NPM16 posters! Our bookmarks are now out of stock, but you’re encouraged to download our graphic to the right and print your own. Plan an event! We are pleased to sponsor a limited number of readings and events across Canada for NPM. To be eligible, events must relate to the theme of the road, must take place during the month of April, and be free and open to the public. The deadline to apply for funding has been extended until February 29. For more information, visit poets.ca/npm. We are also happy to promote all events happening throughout National Poetry Month, not just those readings we provide funding for! If you’re planning an event for NPM16, visit poets.ca/events to find out how to submit to our listings. Make sure you check out the hashtag #NPM16 to find events happening near you! Join the conversation! Follow us on Twitter, Instagram or Facebook, and use the hashtag #NPM16. Celebrate the League of Canadian Poets 2016 Poetry Awards! On Monday April 4, 2016 join us online when we reveal the shortlists for the 2016 Gerald Lampert and Pat Lowther Memorial Awards, the Raymond Souster Awards, and the winner of the 2016 Sheri-D Wilson Golden Beret Spoken Word Award. Find the announcement online at poets.ca/awards. Join the 2016 Mayor’s #PoetryCity Challenge! To celebrate National Poetry Month and UNESCO World Poetry Day, each year municipalities across Canada are challenged to bring poetry into politics. One mayor leads this annual challenge by inviting a poet to read at a council meeting in March or April, and challenges mayors and councils across the nation to follow suit and join the celebration. Calgary Mayor Naheed Nenshi will once again be leading this challenge in 2016. Make your city a #PoetryCity! Visit poets.ca/poetrycity to find out more about this year’s challenge and how to get involved. Download a PDF with more information about National Poetry Month 2016 here. Pour les matériaux en francais, cliquez ici.